Here’s something to keep close at hand during the next 24 hours. I’ve compiled a chart of the 20 councils it should be easiest for Labour to win. I’ve presented it in the style of the battlegrounds Peter Snow used to wield with such delight during the BBC’s general election night coverage. 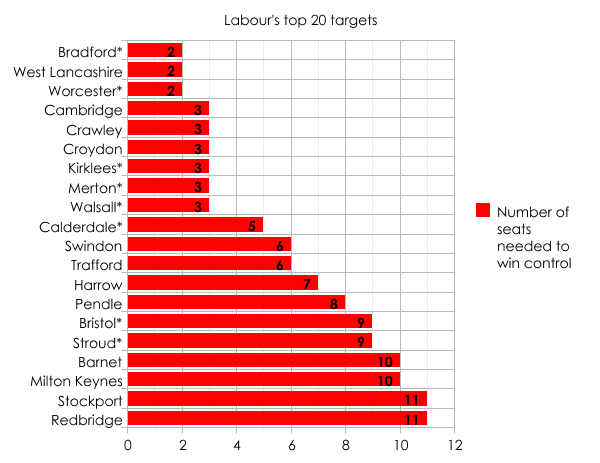 A mark of Labour’s success will be how far down this chart they are able to progress, beginning at the top with those councils that need the fewest number of seats to change hands, then moving downwards as the task become steadily more challenging. The councils marked with an asterisk are those which Labour already runs, but as a minority administration. If Labour manages to win outright control of most of these 20, the party can justly say it’s put in a successful performance. If not, and only a few end up in Labour’s hands, things will be looking pretty miserable.